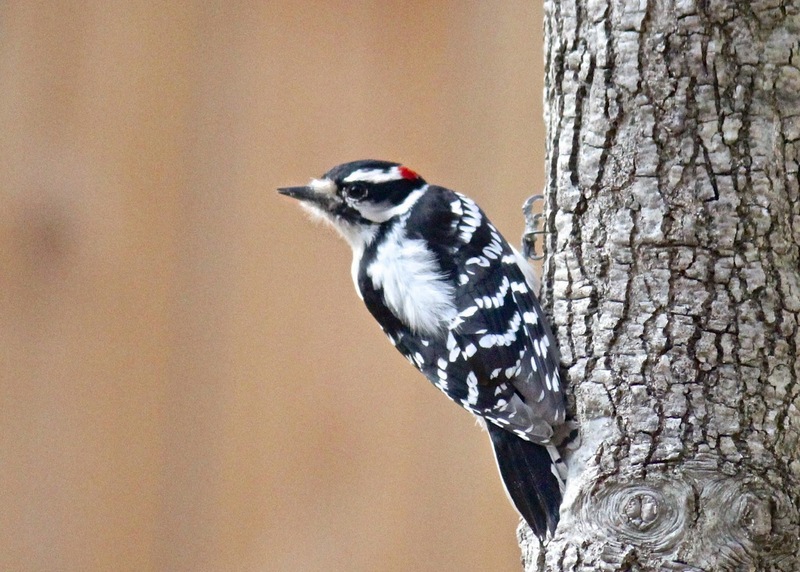 While the little Downy Woodpeckers are very common at bird feeders, the shier Hairy Woodpeckers will come to feeders as well, and it can often be tricky to tell the difference between the two. Apart from their size, the easiest way to identify which is which is to look at their bill. 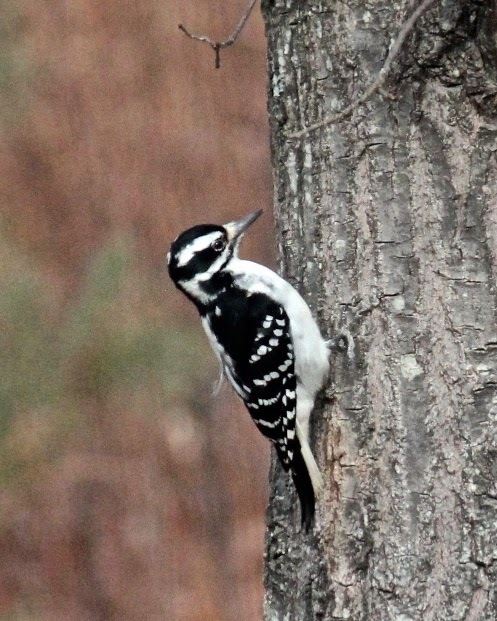 Hairy Woodpeckers have very long, chisel-shaped bills. The bills are about as long as their head is wide. 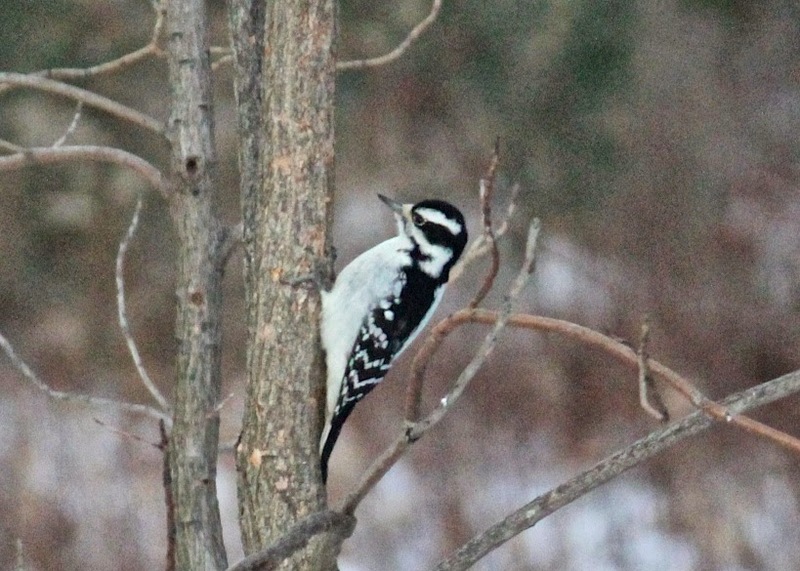 The Downy Woodpecker, on the other hand, has a small bill. It is only about 1/3 of the width of their head. The Downy's bill also has a more noticeable downy tuft of nasal bristles around the base of it. 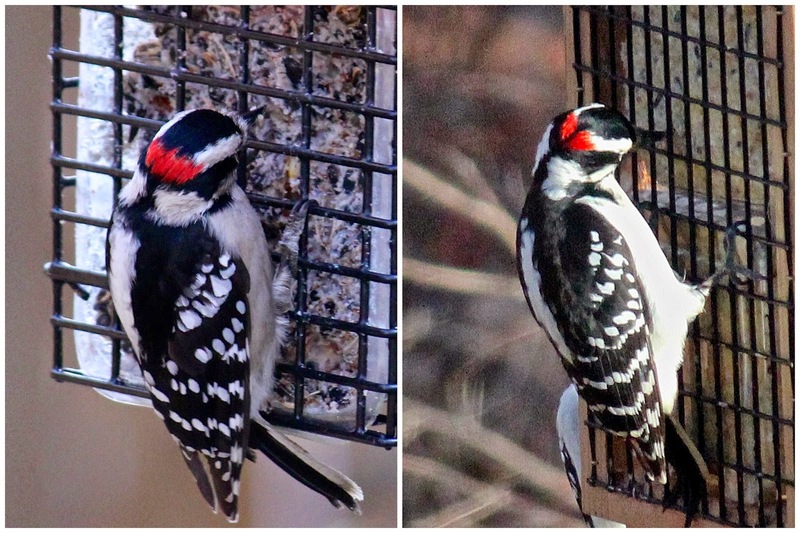 One more difference can be found with the male woodpeckers. 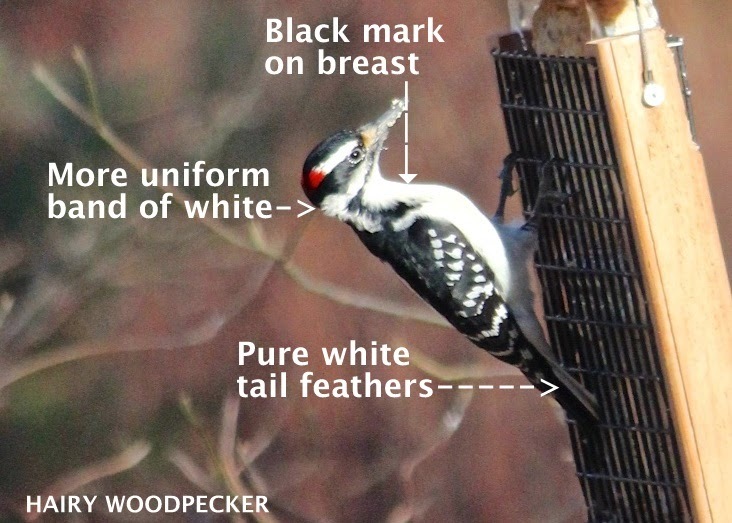 The males of both species have a red patch on the back of their head, but if there is a black line running through the middle of it, it is mostly likely a Hairy Woodpecker. So think you know the difference between a Downy and a Hairy? See if you can tell which is which in these pictures... some of them are tricky! Here they are, as well as some of the distinguishing marks in the pictures. So how did you do? It's definitely harder when they aren't on a bird feeder, so there's no relative frame of size! 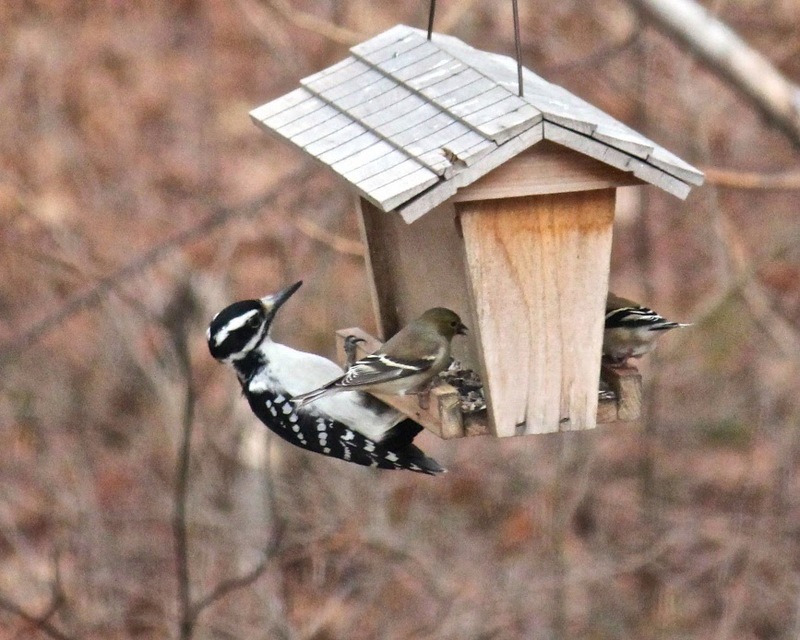 for the Great Backyard Bird Count if you can! When I first started feeding the birds a few years ago, I had no idea which birds were which. With the Great Backyard Bird Count coming up (Feb. 13 - 16! ), I thought I would post a list of birds commonly seen in yards and at feeders to help new bird watchers identify them. 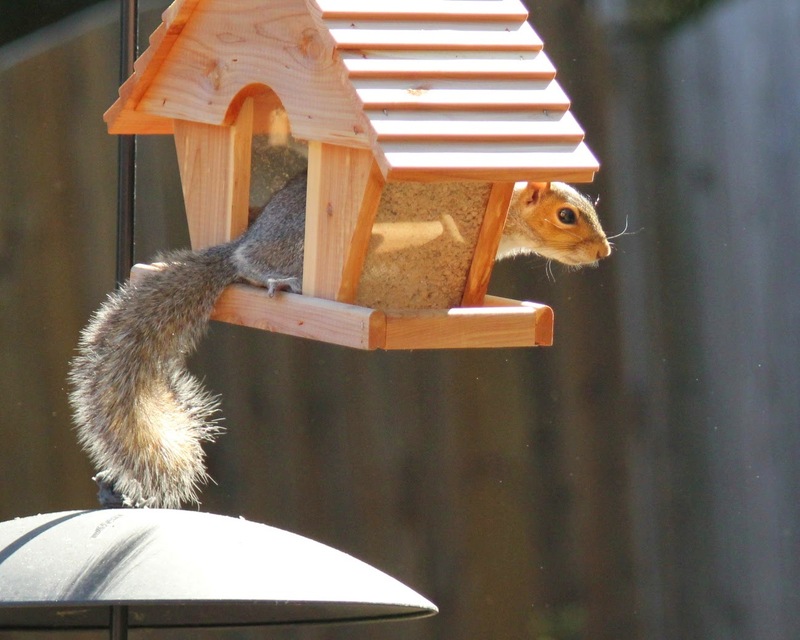 If you put out a new bird feeder, this is usually one of the first birds you will see! This is the little round bird with the black and white head. There are two slightly different species. 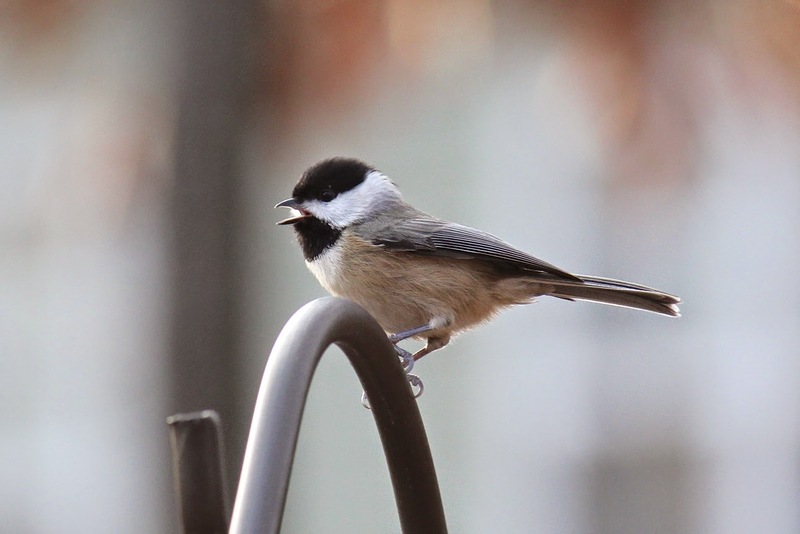 In the North, it's a Black-capped Chickadee. In the South, it's a Carolina Chickadee. If you live in the small band in the middle where there is overlap, you'll have to look a little more closely. The Sibley Guides website has a good article about the differences. 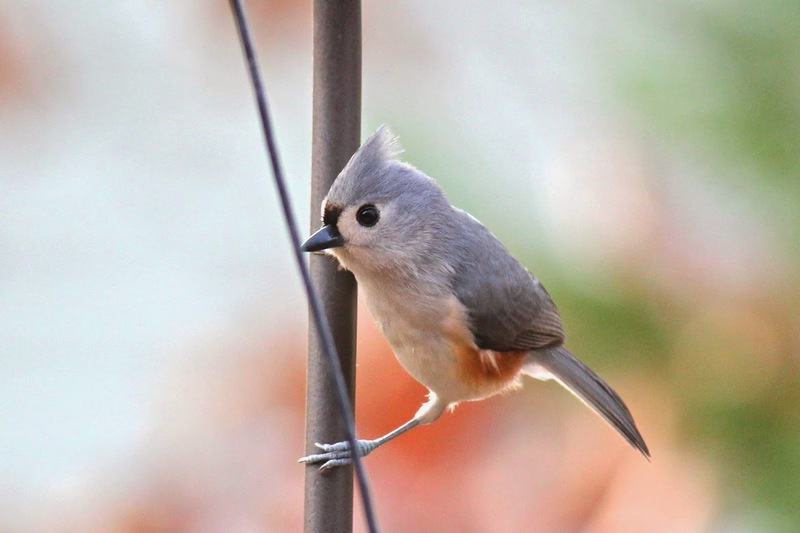 The Tufted Titmouse is the gray-backed bird with a little tuft of hair on top. So cute! 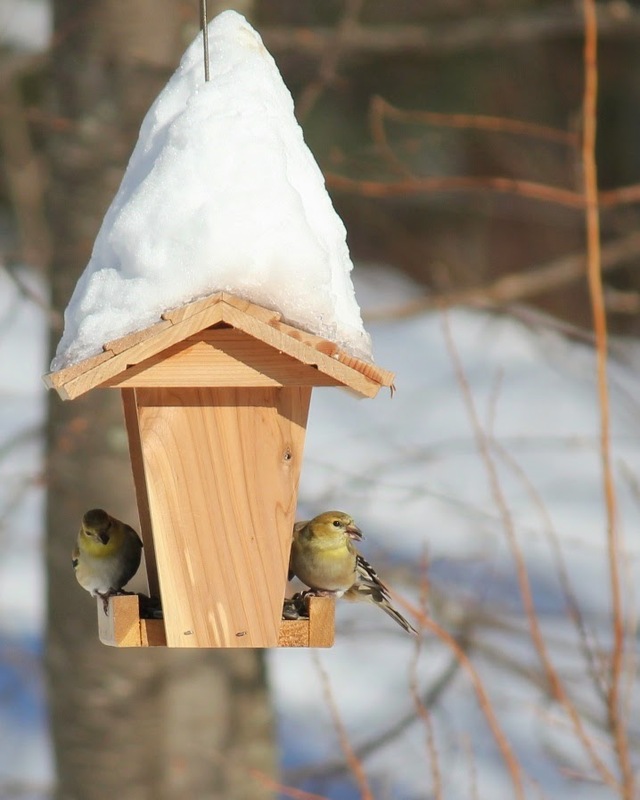 The American Goldfinch is a small finch that comes to feeders in flocks. In winter, they only have a little yellow on them, but in spring, the males turn flamboyantly golden yellow! 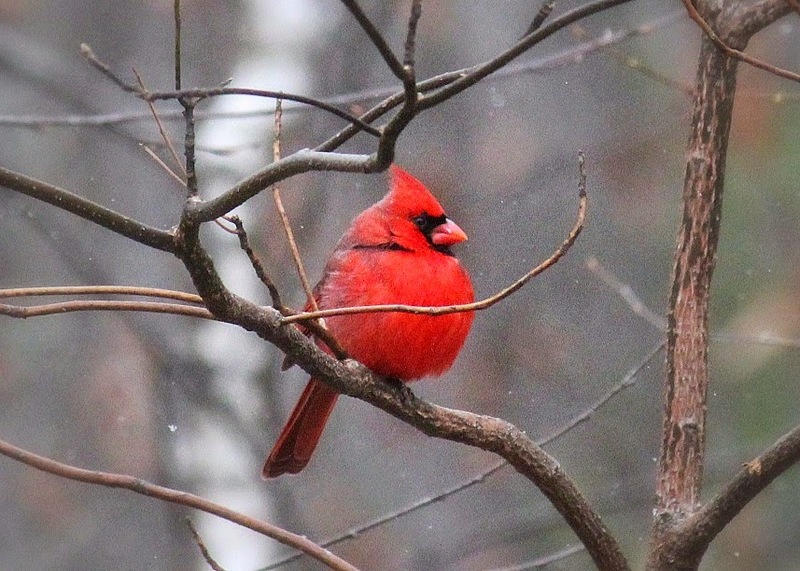 Most people can spot a Northern Cardinal pretty easily. The female has more brown on its body, but still has the signature red bill, wings, tail, and crest. 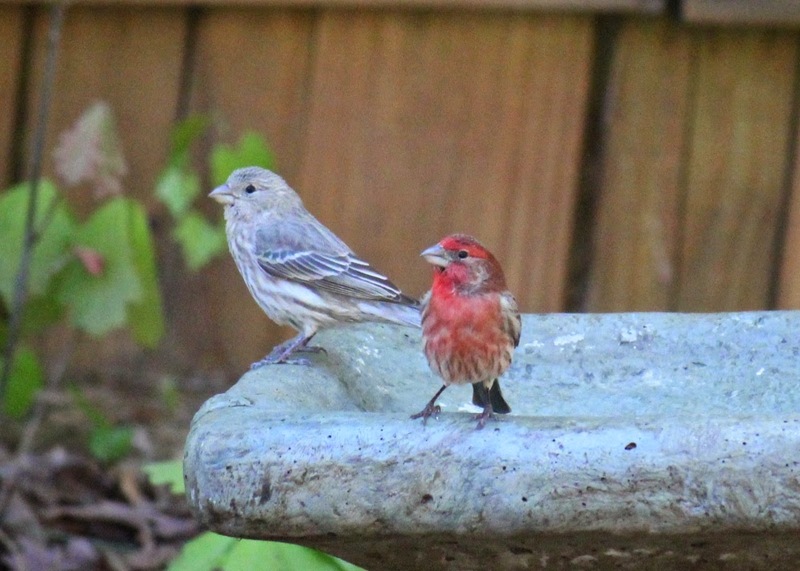 A male House Finch is fairly easy to spot, with a red face and chest. The female is harder, being one of those nondescript brown birds with a brown-and-white streaked chest. I usually can tell it's a House Finch from the beak, which is wide, much like a Cardinal's. 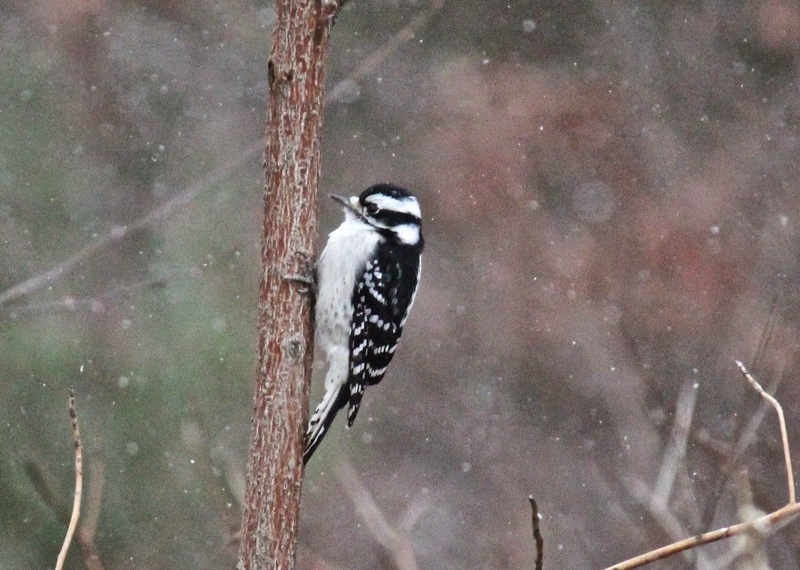 One of my favorites, the common Downy Woodpecker is a teeny-tiny woodpecker that loves bird feeders. Much like Woodpeckers, you will see Nuthatches scrabble up and down tree trunks. They crane their head up at an astonishing angle and then zoom to the bird feeders. 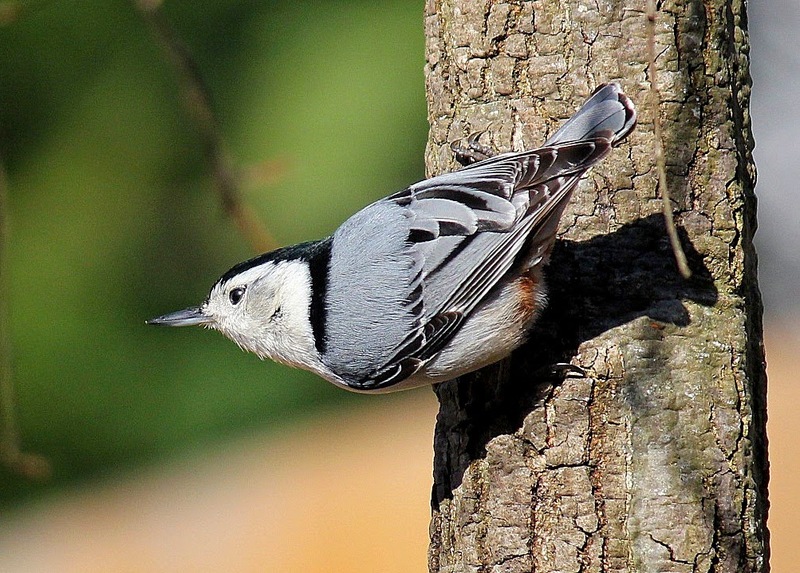 The common White-breasted Nuthatch has a blue-gray back and a white face and breast. 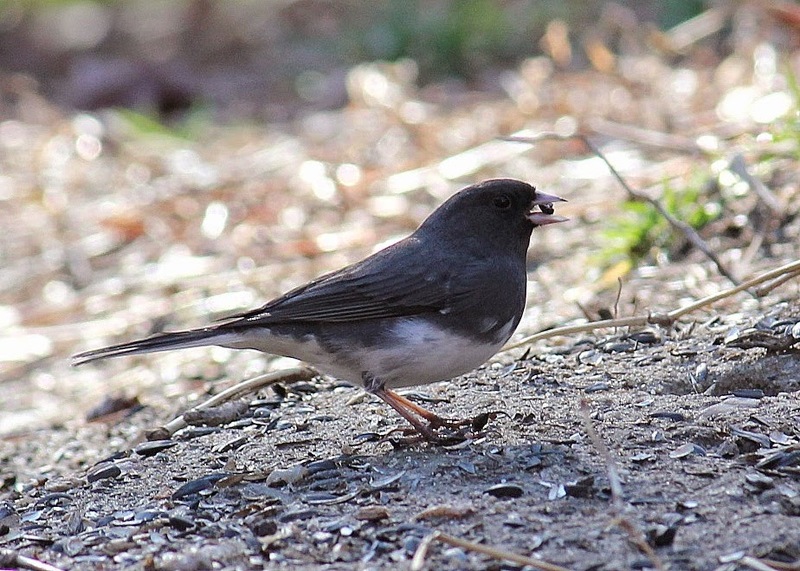 You'll often see flocks of little white-bellied Dark-eyed Juncos hopping around on the ground in search of food. See a large bird strutting around on the ground making sad cooing sounds? It's most likely a Mourning Dove. 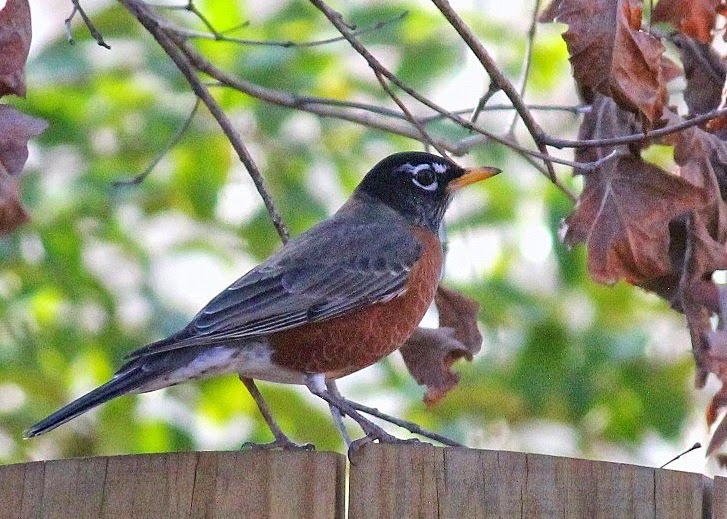 American Robins are large birds that you often see hopping around on lawns looking for earthworms. I hope that helps get some new bird watchers started! 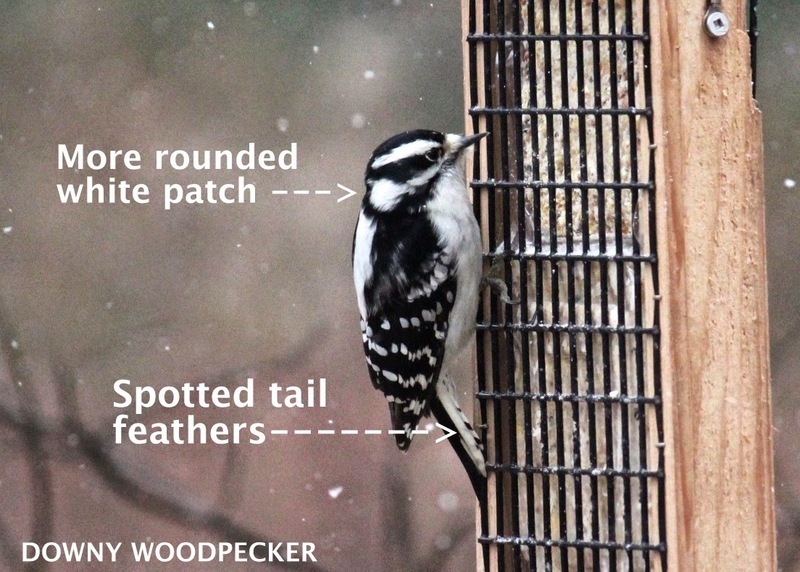 For more visual aids, the Great Backyard Bird Count has a great list of the most common birds, and Project FeederWatch has an even more extensive chart. 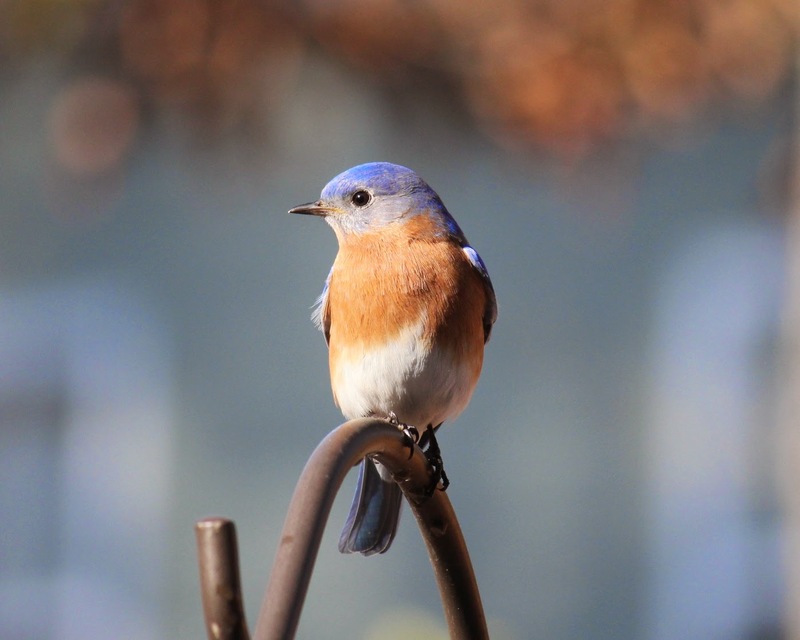 So what is the most common bird in your backyard? 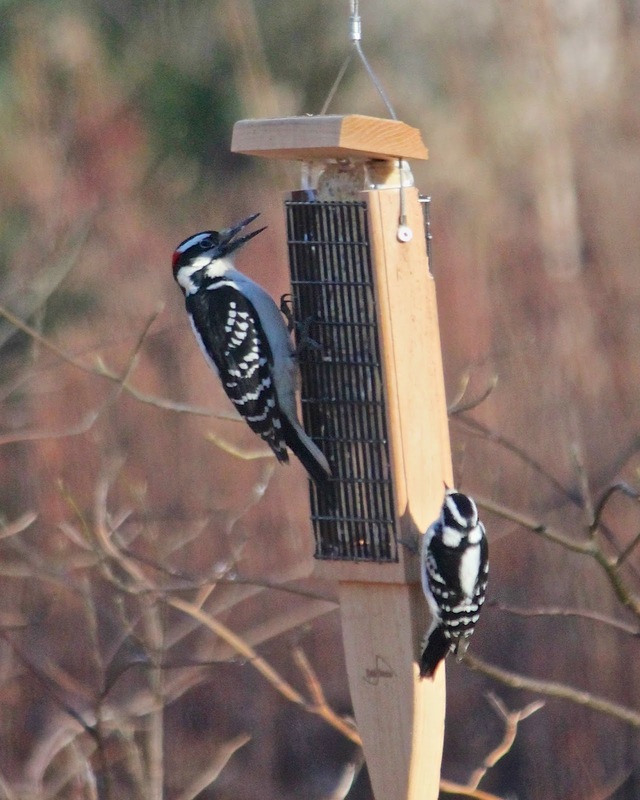 Coming Soon: The Great Backyard Bird Count! 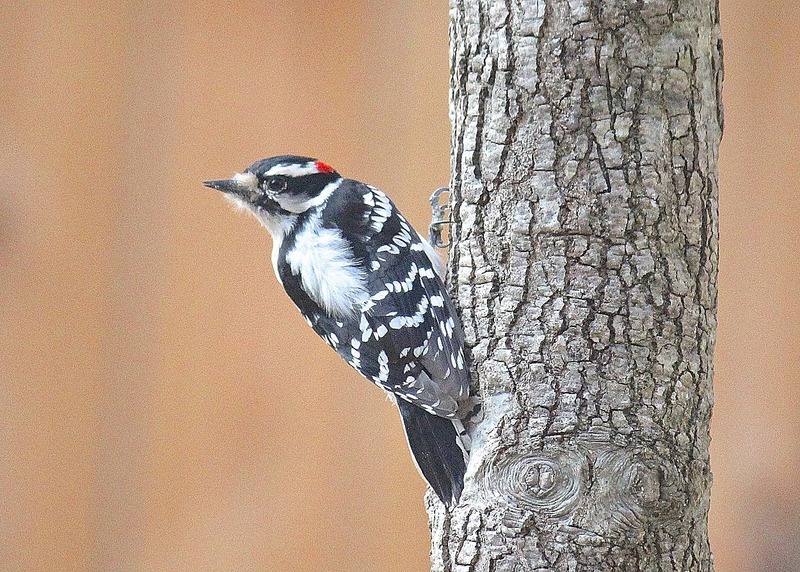 Coming soon to a backyard near you: the Great Backyard Bird Count is almost here! Every year the kids and I participate, and it can be quite a lot of fun! So what is the Great Backyard Bird Count? 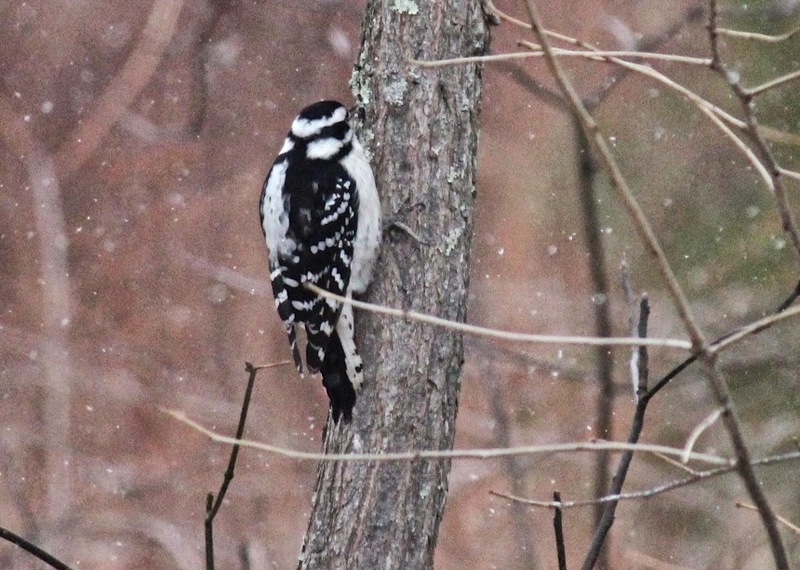 From February 13 - 16 this year, everyone is being asked to count how many and what type of birds they see for at least 15 minutes, then log their results at the GBBC website. Last year over 140,000 people in 135 different countries participated and counted over 17 million birds! That is a powerful lot of data, people. 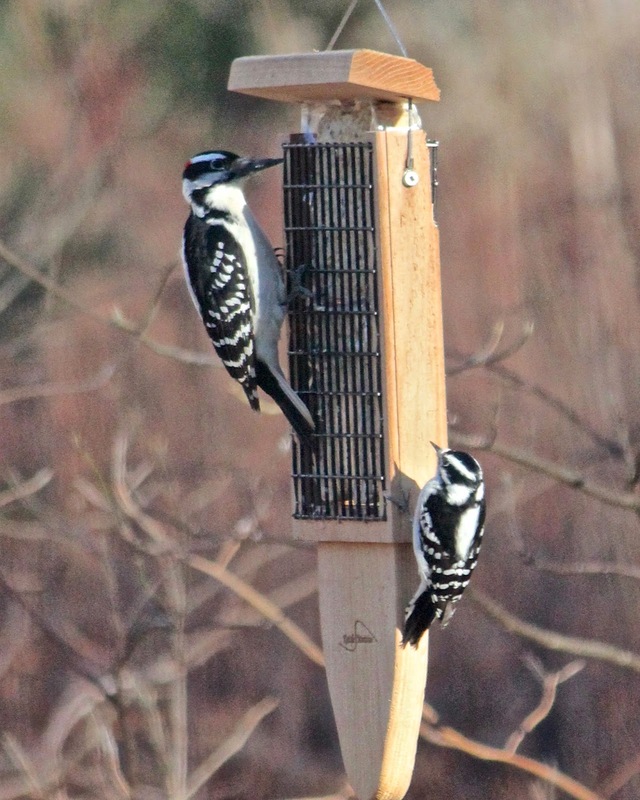 The Great Backyard Bird Count was started in 1998 by the Cornell Lab of Ornithology and the National Audubon Society. Some of you might know about the Cornell Lab from their online bird guide, All About Birds. When trying to identify a bird, that is usually where I end up! My favorite feature of their online guide is the 'Similar Species' sections. As long as I know what bird it sort of looks like, I can go to their bird guide and browse through birds that look similar, and then usually I'll find it. 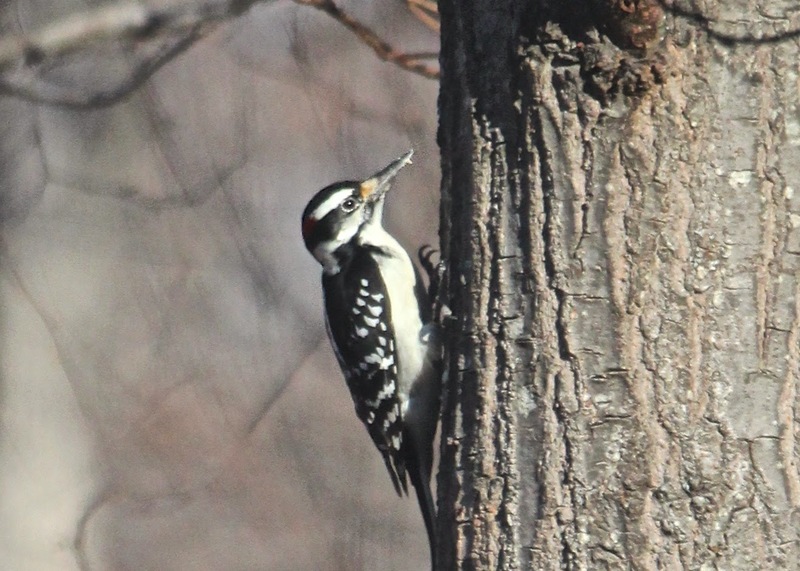 The data from the Great Backyard Bird Count helps researchers track bird populations. Due to weather, habitat changes, or other factors, different species will increase or decrease. 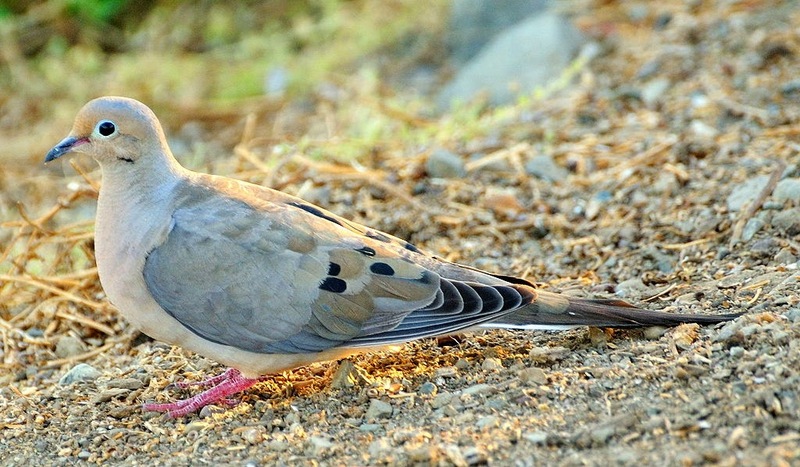 Bird populations will move, sometimes migrating to new locations. 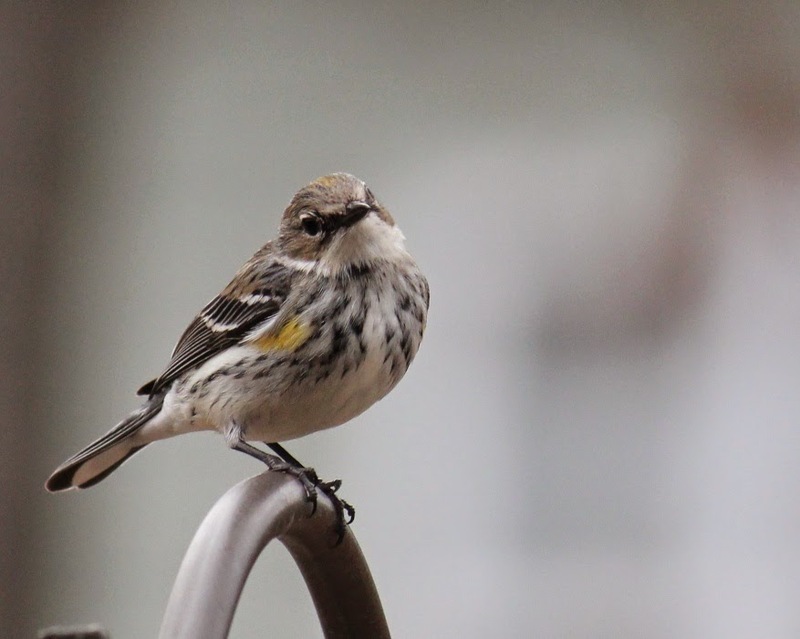 Last year's data showed the effects of the cold 'polar vortex' in the US, a finch 'superflight' to new locations due to food shortages in Canada, certain Mexican species moving north due to climate change, more Snowy Owl invasions into the US from Canada, and a surprise Yellow-Rumped Warbler that somehow made it all the way to England from North America! 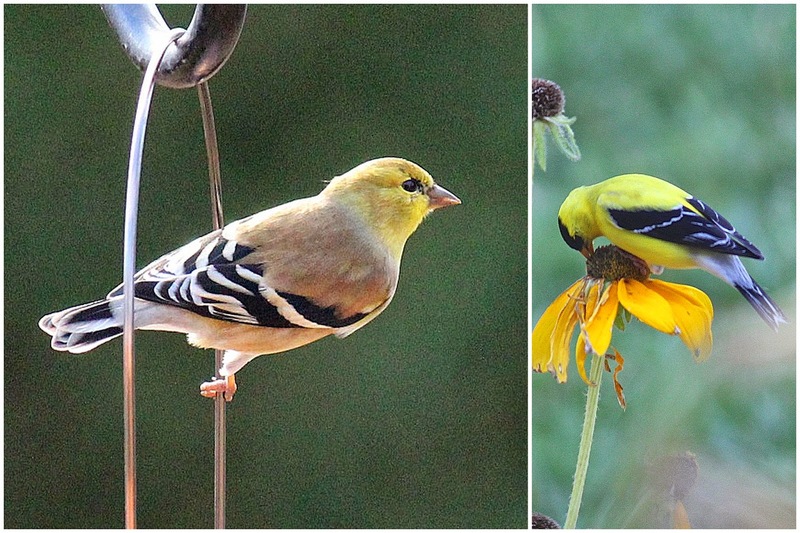 In honor of the Great Backyard Bird Count, the next few blog posts will be focused on birds and birding. Ever since Mr. Red House and the kids gave me my first bird feeder several years ago, I've gotten really into bird watching. It's so much fun, and I especially appreciate it in winter, as it connects me to the outside when the cold weather keeps me inside. So mark your calendars for February 13 - 16! I wonder what the data will show this year? Are you planning on participating?